There has been a recent dramatic increase in the number of player complaints lodged against Playtech casinos. The nature of the complaints is usually bonus-related, with an invariably large sum of money being confiscated by the casino on the basis of the clause which states "We reserve the right to withhold any sum, for any reason, at our sole discretion", or words to that effect. All casinos carry this clause; however, only the criminal element actually invokes it as justification for denying winnings on the basis of anything other than 1) player infringement of the terms and conditions they signed up to or 2) player fraud. Invocation of this clause on ANY other basis is the behaviour of fraudsters and conmen. Unfortunately, the management of many Playtech operations now come under this heading: fraudsters and conmen. A player is currently being denied a cashout for $4879 on the basis that he played roulette for the Giant Vegas signup promotion - a $200 sticky bonus for a $200 deposit - and that roulette was in fact an "excluded game", a game the playing of which entitles the casino to revoke any winnings. Video Poker is an excluded game and may not be played until such time as the wagering requirements for this particular bonus have been met. The Casino reserves the right to withhold any amount in excess of the player's original deposit from a player's withdrawal if the bonus is wagered on the above games, before the wagering on allowed games is completed fully. Bets on roulette...do not count towards the wagering requirements. All I can say is that there are three accounts with exactly the same play, opened on the same day (along with other warning signs that they employ wrt fraud) and that is reason enough. No evidence was ever presented to add any weight to the argument that these four players may have been the same player, or that anything genuinely fraudulent had occurred. I have tried all I can to remedy this issue, to no avail. I have also cancelled the contract with BetRev which is the affiliate program for Giant Vegas and Royal Dice. I will therefore no longer be associated with the program, although I will continue to try and resolve issues relating to their performance to ensure that affiliates are treated fairly. Giant Vegas operated originally on the RTG software platform, changing to Playtech in 2004; whilst with RTG, they had a reputation as slow-payers, and in fact it took affiliate intervention for me to receive a $1400 cashout. Since the move to Playtech, things appear to have deteriorated further. The matter is ongoing, and can be read in detail in the Giant Vegas thread at Casinomeister. A player signed up and deposited at Swiss Casino, taking the new player signup bonus. He played blackjack and videopoker, and cashed out a $6000 win. The casino confiscated his $6000 winnings. Before processing your withdrawal request we have noticed a pattern of bonus abuse in your game sessions. Due to this we have subtracted the bonus money that was given to you and your winnings, processing only your original deposit. The Casino reserves the right to refuse or rescind the bonus for any reason including, but not restricted to, player abuse. In case of abuse, the Casino reserves the right to discontinue player's membership and to prevent the player from accessing the Casino in the future. Bets placed on Baccarat, Craps, Roulette, and Sic Bo do not count towards the first deposit bonus wagering. Would Swiss Casino have "detected a pattern of bonus abuse" if the player had lost, and refunded his deposit? Of course not. This is the classic win-win online casino scenario - if you lose: thanks very much for the money; if you win: here's your deposit back but we're keeping the winnings. The casino may block him from future promotions, they may even close his account - but he must be paid first. If not, Swiss Casino should be considered a rogue operation and avoided at all costs. Read the currently ongoing discussion in the Swiss Casino thread at Casinomeister. In the interest of fair gaming, we ask that you wager a minimum of fifteen (15) times your play bonus plus deposit (15 x (bonus + deposit) before requesting a withdrawal. Wagers placed on the following games will not count towards fulfilling your minimum wagering requirements on the above £888 welcome bonus offer: Any versions of Baccarat, Craps, all versions of Roulette, all versions of Sic Bo, all Video Poker games, Blackjack Switch and Blackjack Surrender. The listed games are not excluded, they simply do not count towards the wagering requirements of the received bonus. This rule is correct; that non-counting games are the same as excluded games is plainly incorrect. 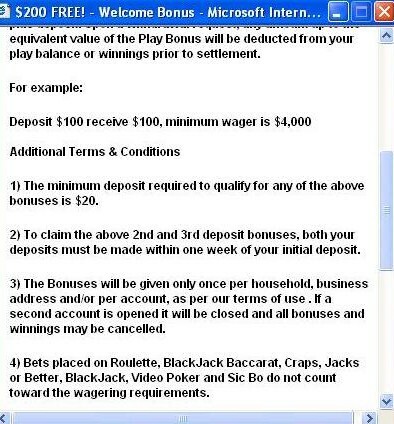 The rules on the bonus page are seemingly clear enough - they list the wagering requirements and the non-counting games; most players would look no further than this since all the relevant information is apparently contained therein. We reserve the right to withhold any amount in excess of the player's original deposit from a player's withdrawal if the play bonus is wagered in any versions of Baccarat, Craps, all versions of Roulette, all versions of Sic Bo, all Video Poker games, Blackjack Switch and Blackjack Surrender. This extremely relevant text - that these games are not only non-counting but also EXCLUDED - is not mentioned on the bonus page; it is only mentioned on this most dry, dull, legalistic and lengthy agreement page, where almost no player would ever think to look. In this way, Vegas Red Casino ensures that players will accept the signup bonus and play a bunch of games which are seemingly acceptable but simply not included in the wagering conditions, whilst craftily locking them into a no-win situation with this deeply-buried rule. If the player loses, the casino will keep his deposit; if the player wins, the casino will invoke this hidden clause to confiscate their winnings. Read the discussion in the Vegas Red thread at Casinomeister. These casinos use cheap tricks to entice players into playing games that will lock them into no-win situations, in which they will never be able to cash out a win. Avoid these four rogue operations at all costs. All these casinos should be treated with extreme caution. There may be a cap on no-deposit bonuses. It looks like, and is, a ripoff, but if that term is stuck somewhere in the rules there won't be much you can do. It's not what you want to hear, but if it IS a no-deposit bonus cap issue, you realistically you have no chance of collecting. Sorry to be the bearer of bad news.